Snover in game: 2,531 Who? Important notice! Pokemon Snover is a fictional character of humans. 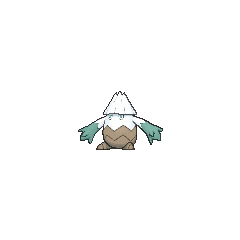 Snover (Japanese: ????? 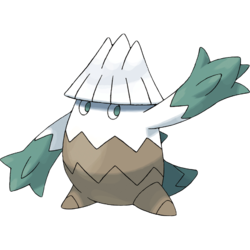 Yukikaburi) is a dual-type Grass/Ice Pokémon introduced in Generation IV. Snover made its debut in Pikachu's Exploration Club. Dawn's Piplup and Ash's Aipom bump into one while wandering around in a cave and it went on a rampage. A talking Snover appeared in Pikachu's Ice Adventure!. A male Snover appeared in The Lonely Snover where it wanted to be friends with Ash and his friends. A female Snover was used by Candice to battle Ash in Sliding Into Seventh!. A male Snover appeared in Over the Mountain of Snow!. 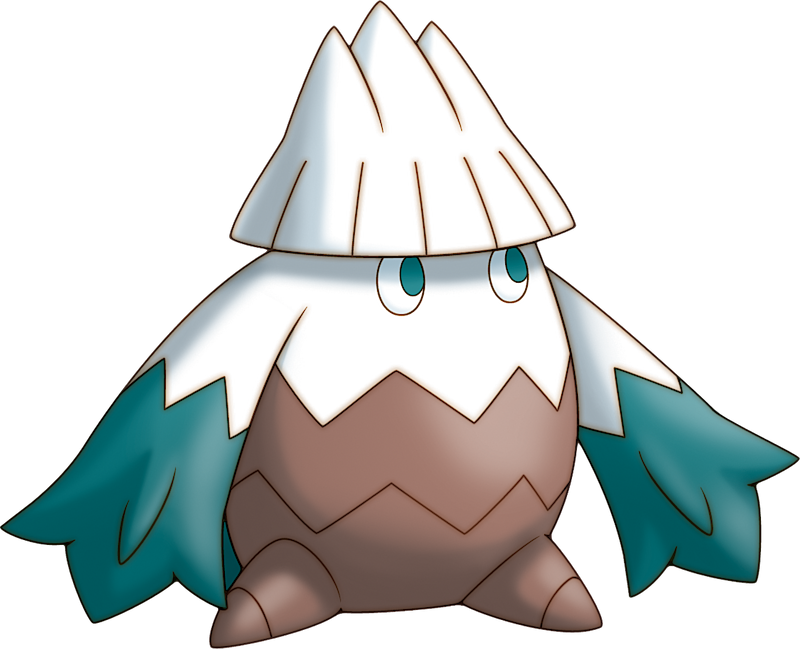 A Snover also appeared in Giratina and the Sky Warrior as one of the many Pokémon attempting to stop a glacier from destroying the nearby village. A male Snover appeared in Challenging a Towering Figure!. A Snover appeared in the opening scenes of Zoroark: Master of Illusions. Candice has a collection of ice Pokémon in her Gym that includes multiple Snover, but the only one she uses in battle is the one that fought Platinum's Empoleon, which also happens to be the only one she caught. She was seemingly defeated by the Emperor Pokémon's Metal Claw, but managed to launch a Seed Bomb that landed on Empoleon's head, fainting her and resulting in a tie. "A Frost Tree Pokémon. 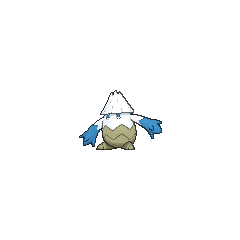 It lives in snowy mountains and resembles a wintry peak. In the spring it grows berries that resemble ice candies. 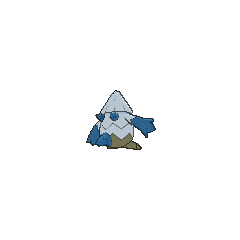 In battle it causes a storm to appear, hides itself in fog, and then composes and launches a ball of ice as a preemptive strike. 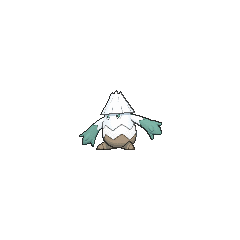 It evolves into Abomasnow." Snover appears to have been based on the daikon radish, also known as the winter radish, which are traditionally harvested and eaten during the winter. 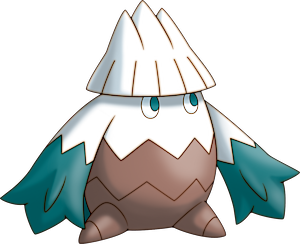 It's also possible that Snover was made to resemble a snow-covered fir tree. 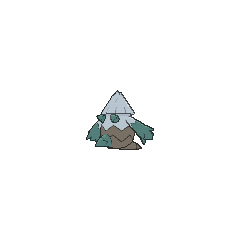 Its 'hat' resembles the kanji for mountain (?) which originates from a pictogram of three mountain peaks. Yukikaburi is a combination of ? yuki (snow) and ? kaburi (head). Alternatively, it may also derive from ?? kabu (turnip) or ??? kabuseru (to cover). Japanese ????? Yukikaburi From ? yuki (snow) and ? kaburi (head). Alternatively, it may also derive from ?? kabu (turnip) or ??? kabuseru (to cover). Mandarin Chinese ??? Xue Lì Guài From ?, ?, and ?.